I picked up this book on the recommendation of a friend. She told me that I would love the setting of this mystery novel. Well she was more than right! Set in the countryside near a quaint town is the hotel of every library employees dreams. The resort hotel of Storyton Hall is filled with a variety of libraries. A getaway for lovers of the written word; Storyton Hall offers quiet reading nooks and exquisite tea services to its guests. The opening chapter describes the manager of the hotel, Jane Steward, climbing the rolling ladder of my dreams to run her hands over old copies of leather and linen bound books. With the whimsical descriptions by author Ellery Adams I could almost smell the ink and bindings. Jane Steward needs to boost business in order to make some much needed repairs on her beloved hotel. She is inspired by a first edition Agatha Christie to host a "Murder and Mayhem" week of activities at the hotel. This murder mystery inspired week brings in many guests and the hotel gets their much needed bookings. All is going well until one of the guests, a unique character by the name of Felix Hampden, shows up dead in the Mystery Suite after winning a copy of a prized rare book. The story unfolds with Jane doing her best to maintain composure in front of the other guests. Will the mystery be solved before more people pop up dead in her hotel? Let's hope so because I could love to book a stay at this dreamy sounding hotel. 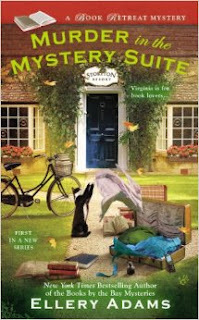 Pick up a copy of Murder in the Mystery Suite today in our Mystery Paperback section at your nearest branch or check it out in streaming audio through Hoopla.